This is Rugelachs, part II. 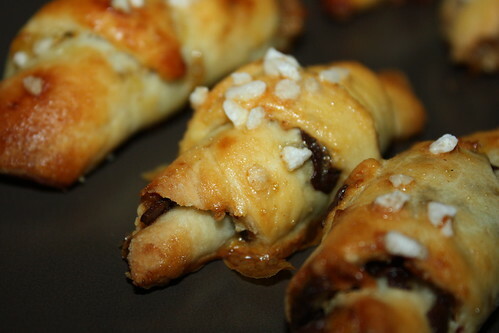 I made the Rugelachs from Dorie Greenspan's "Baking" not too long ago as one of the rewinds end of 2011. Rugelachs are not all that common where I live. But ever since I held "Baking" in my hands for the first time, I was very muched appealled by their looks. I really like them but had always been a bit timid. They are not really hard in the making and even if you are no heroine in food presentation, they always look good anyways - but: it involves many steps and a lot of waiting time in between. Nevertehless, it is for sure worth the fuzz and if you have the time you should try them! I made mine with orange marmelade and cranberries and loved them! If you are interested in the recipe, head over to Margarets page "The Urban Hiker" or Jessicas page "My baking heart" - or have a look at pp. 325-327 Dorie Greenspan's/Julia Childs Baking with Julia. I agree, they are certainly worth the time spent. Now I can say I have made Rugelach! your cookies looks prefect .. good job ... Aren't they a delight !!! Loved it !!!! Very nice - especially with the topping!